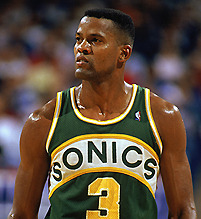 After being drafted by the Dallas Mavericks, Ellis found himself traded to the Seattle SuperSonics in 1986. His playing time increased significantly, and his regular season scoring average reflected this as it jumped from 7.1 points per game with the Mavericks to 24.9 points per game with the SuperSonics. Ellis' rise with the SuperSonics was recognized around the league, which awarded him the NBA Most Improved Player Award in 1987. Ellis continued to star for the SuperSonics in the late 1980s, with his scoring average topping out at 27.5 point per game during the 1988-89 season. The 2,253 points he scored that season broke NBRPA Board Member Spencer Haywood's franchise record of 2,251 and remained the SuperSonics/Thunder record until Kevin Durant broke it in 2009-10. Ellis was selected to the NBA All-Star Game during the same season, and scored 27 points for the West. In all, Ellis spent four and a half seasons with the SuperSonics before once again being traded, this time to the Milwaukee Bucks. While he was again a bench player with the Bucks, his minutes still remained relatively high and Ellis still made large contributions to the team with his scoring ability. Following the conclusion of the 91-92 season, he found himself traded to the San Antonio Spurs for Tracy Murray. As a member of the Spurs, Ellis once again found himself in the starting lineup playing slightly more minutes than he did as a Buck. Although his production largely remained the same, he was doing it much more efficiently, shooting nearly 50% from the field as opposed to 46% with Milwaukee. Ellis also played for the Denver Nuggets, had another stint with the SuperSonics, played with the Bucks and Charlotte Hornets to end his career. All in all, Ellis played in 1,209 games and had career averages of 15.7 points per game, 3.5 rebounds per game, a .479 field goal percentage, and a .403 three point field goal percentage. He is seventh all-time in three-point shots made with 1,719. He holds the NBA record for most minutes played in a single game, when he scored 53 points in 69 minutes (out of a possible 73) for the SuperSonics in a 155-154 loss to the Bucks in five overtimes on November 9, 1989. Dale is also a Marietta, GA native and currently resides there today.